Gunnhildur’s boss doesn’t think she can handle it. In fact wants her out of his hair and ‘promoted’ to even smaller backwater in Iceland. He doesn’t seem to like tenacious cops who ask awkward questions of politicians and their wives living it large as if in the last days of Pompeii, which Iceland was like back in 2008 before the bank crisis brought this small island back to sanity. Gunnhildur and her small team including Snorri and Bjossi realise that their murder is linked to a random road death elsewhere on the island and there’s a connection somehow to a new aluminium smelter going up nearby and a swish PR agency called Spearpoint in Reykjavick. They realise there is a killer on the loose hiding in plain sight who is a lot smarter than the villains that they are generally used to. Gunna isn’t going to be intimidated by the rich folks in the city, even if they do have a Government minister in their back pocket, but she’s making enemies day by day and the police budget is stretched to the limit. Meanwhile there’s someone called Skandalblogger with insider information trying to blow the government and their hanger’s on out of the water, whilst Gunna has to deal with a young crime reporter Skuli who has decided to write a feature about her dull small town police life and is rapidly being disabused of this notion. Yes there are comparisons to Wallender, there is frustration and good natured joshing as increasingly the team are out of their depth, but like Menkell before him, Bates has created characters you grow to like and bond with. 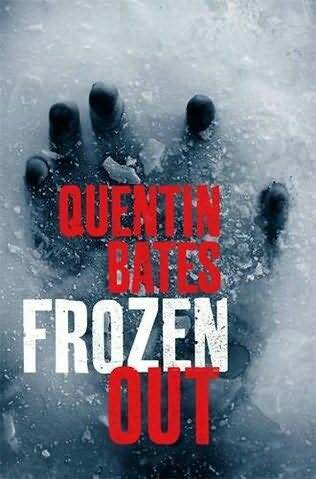 If Girl with a Dragon Tattoo hasn’t already woken your appetite for all things Nordic, Frozen Out by Quentin Bates is compelling fast paced stuff that never falters. Set against the rapidly disintegrating atmosphere of Iceland’s banking crisis this is an extraordinary insight into the arrogance and amoral life that was Iceland back then. Throughout it you believe in grumpy Gunnhildur and the authenticity of Quentin Bates’ Iceland. Bring on book two; Gunnhildur will be around for years to come with her acerbic manner, sharp insights and ready to throw her weight around.